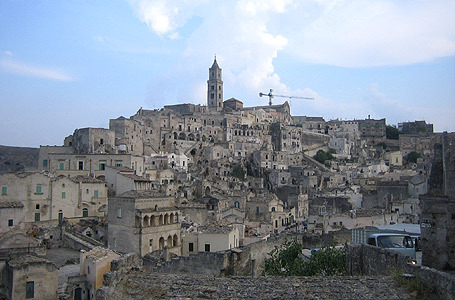 The City was established on the Gravina di Matera (tributary of Bradano), 200m above sea level. The Town Planning of Matera is unique in its genre. It is built on a calcareous ram of the western Murge and faces towards the deep gorge of the Gravina with its sheer cliff walls interrupted by two hollows: the Sasso Barisano to the north and the Sasso Caveoso to the South. The “Sassi” (Stones) are the old, picturesque, rocky landscape quarters of Matera, with habitation for the most, excavated from volcanic tuff, disorderly placed one on top of another, and often having only one façade in brickwork.